Many of you are planning on attending the “My Life God’s Story” event at TACC on Saturday. Have you thought about your own pages in God’s narrative? 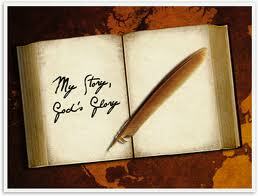 Personal testimony is a powerful way to tell others how God has authored your story. The Storyframes Collective is a collaborative effort between The Gospel Coalition and the Austin Stone Church for the purpose of celebrating the extraordinary work of God in the lives of ordinary people. Through excellence in the art of storytelling (film, photojournalism, spoken word, and writing), this project aims to recount God’s redemptive, transforming work in the lives of our brothers and sisters. In form, this website collects encouraging stories about God’s grace. In function, we want these stories to inspire you to praise God. As a collective, we hope that people from around the world will join us in collecting and telling the amazing stories of God’s grace and the power of the gospel. We hope this project will increase your faith, encourage your spirit, and open your eyes to the extraordinary work of God every day in your life and in the lives of others around you. While these stories differ in characters, formats, and locations, they share the same hero: God. Whether highlighting addiction recovery, healing, renewal, transformation, or any other form of good news, they testify to God’s power and grace, made available to us through the person and work of Jesus Christ. We hope you not only enjoy reading, hearing, and seeing these stories, but also take time to observe the stories of those around you. Tell others the story of what God has done for the world in Jesus Christ, and tell us your story—what God has done in you. The following article links to a website collection that artistically binds the stories of people who praise the sovereign work of God in their lives: Whether I Live or Die, God Wins – The Gospel Coalition Blog. Solomon’s beautiful proverb tells us that wise words are like “apples of gold in settings of silver.” I would like to suggest that wise deeds and apt responses to life situations are similarly beautiful. Let me share a few of the words of some of those who have shaped the course of my life, in roughly chronological order. Their grace has become not just my example, but who I am. John Stott, as he preached in Toronto: “You are here so you can learn the secrets of Christian growth and living. Well, there are no secrets. You read the Bible and you pray.” Revolutionary to my husband and me. Susan Schaeffer Macaulay at English L’Abri: “Sometimes I realize I haven’t really prayed or read the Bible for a couple of weeks . . .” (And how would you, dear Susan, with your service to all of us?) So this really can happen with a sincere Christian? Whew! Now I can look God in the eye again. And back to L’Abri–English L’Abri this time: “There is nothing more than Christ. No higher wisdom. Nothing more.” I finally “got it.” Sola Scriptura, knowing Christ through Scripture alone, became the bedrock of my life. On to a little side trip we made to Oxford at this time: The porter of Magdalen College: “Yes, I knew CS Lewis. What do I remember about him? The main thing is how he would always share the food packages he got from America during the days of rationing.” Okay, not his intellect; His character! Always ask the tailors, the grocers, the neighbors . . .
Click here for the rest of the article: True Woman | Words That Have Shaped My Life. What in the world?! Where was he getting that stuff? The acting out was escalating, along with the emotional verbal aftermath. I brought this burden with me into our mom’s group Bible study last week. As we shared our burdens for our children, one mom told how she had been intentionally affirming and hugging her problem child multiple times a day and the difference that was making in her child’s attitude. I thought, could it really be that simple?! But I felt burdened afterwards that I should do the same with my son. I knew that giving him extra hugs and affirmation at random times of the day wouldn’t change how I handled his outbursts. I wasn’t going to hug and affirm him if he hit his brother. But I was hoping that if I hugged him and affirmed him when he was behaving, then when the time came to discipline him when he sinned, he would receive it from me without going into his You-hate-me-and-I-hate-myself routine. Click here to read the rest of this article: �Practical Theology for Women: Hugs and Affirmation. The Words of Our Mouth. Ever wish you could take back words you said? Do find yourself lying awake, mulling over a conversation and thinking about what you should have said? In frustration, has your child spewed out something awful at you or a sibling? Ya, think God is trying to tell me something?Do you relate? By the mere fact that you’re a mom tells me that you do. Words are tremendously powerful. They have the power to tear down or to bring healing.The tongue has the power of life and death, and those who love it will eat its fruit, (Proverbs 18:21). If our words are rash, manipulative, or ungrateful, we have the power to bring harm to those we love. Our words can even do damage when on the surface they sound good. We may say thanks, but inside we’re jealous or grumbling against someone. Each day thousands of words flow out of our mouths, but we’re clueless to their effect on ourselves and others, especially those we love the most, i.e. our children. Borrowing from my son’s message, and some things God has spoken to my heart, let’s talk about how to control our tongues. Store up good things in your heart. Our words reflect what’s inside. Whatever we store up in our hearts—anxiety, bitterness, frustration, fear—will sooner or later come spewing out. For out of the overflow of the heart the mouth speaks. The good man brings good things out of the good stored up in him, and the evil man brings evil things out of the evil stored up in him, (Matthew 12:34-35). This takes hard work. It’s sometimes easier to look at problems, rather than solutions and good things. Knowing this, we must make a conscious effort to change our thoughts and stop ourselves before those notions come to the surface. This may mean that we have to confess some pretty ugly things to God and someone we trust so that we find healing. Suppressing our thoughts only causes a buildup that will soon explode like a burning volcano. If we want to make room for good thoughts, the junk has to come out. Look on the bright side. Ask the right questions. In most situations I tend to look at all the problems. Timothy frequently admonishes me about this habit. My excuse has always been that I’m trying to ward off difficulties before they occur. This type of thinking keeps me from making decisions and it waste time. I’m consciously trying to work on this, by asking the right questions and stating things positively. For example, instead asking, “What if it doesn’t work out?” ask, “What’s next when it works out?” Rather than looking at the problems and what could go wrong, look at the benefits. Practicing the spiritual discipline of thanksgiving can help us look at“whatever is true, whatever is noble, whatever is right, whatever is pure, whatever is lovely, whatever is admirable–if anything is excellent or praiseworthy–think about such things, (Philippians 4:8). Then our words become a well spring of life, not confusion and discouragement. Slow down. Think before you speak. This takes practice and prayer. We tend to have knee-jerk reactions to situations, but it’s our careless words that tend to get us in trouble (Matt. 12:36). Filling our hearts up with good and noble thoughts can assure that at least what comes out won’t do harm. One way to learn how to do this is discuss why you said something rash. Simply “yes” or “no.” This is another reminder that I frequently receive from my hubby. He says I “speak in paragraphs” and totally confuse him. Jan Johnsonstates that she realized that her “wordiness revealed a lack of trust that God would work without (her) help. While communication is important, talking has its limits. It doesn’t work if our goal is to express ourselves rather than create space for God’s grace to flow” (Abundant Simplicity). When I bottom-line things, without telling a long explanation, we tend to accomplish a lot more, and life is much more peaceful. Instructing children with short, simple statements helps them understand what we expect more than a long lengthy lecture. Today on Moms Together, let’s share our struggles with taming our tongue. As my son Josiah said yesterday, it’s a small part of the body, but it’s the strongest and certainly has the greater workout. Leave a comment either here or on MomsTogether for a chance to winA Way with Words by Christin Ditchfield.